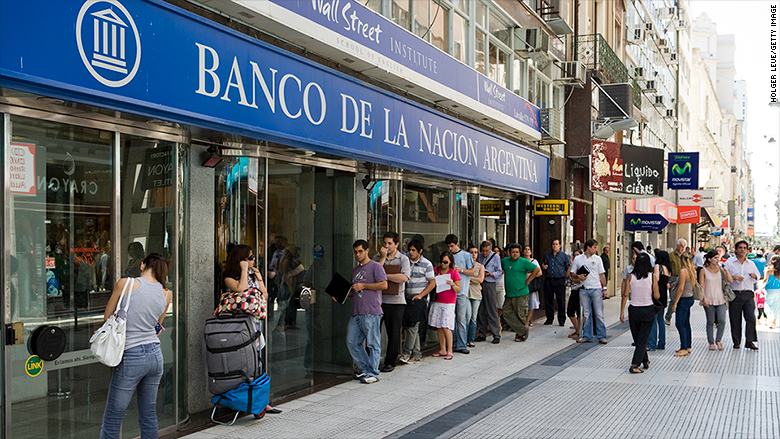 Headaches and long lines are growing atbanks across Argentina in the sweltering summer heat. Bank employees in South America’s second-largest nation are poised for a two-day, nationwide strike starting Monday. Paired with the weekend — banks don’t open on Saturdays — it means Argentina will go four days without access to bank branches. Workers and their powerful union leaders are demanding higher pay to weather Argentina’s stubbornly high inflation, and they’re protesting what they say is a meager proposal by the banks. For millions of Argentines, the strike has caused long lines this week so people can get cash before banks shutter. ATMs will still operate, though many are expected to run out of cash. The strike is far from a full-blown cash crisis. But it’s an eyesore that illustrates how hard it has been for Argentina’s pro-business, pro-trade government to open up such a heavily unionized countryto the global economy. Argentine leaders are trying to lure foreign investors, global corporations and broker a big trade deal between the European Union and the South American trade bloc known as Mercosur. But populist strikes and mass protests are common and show that Argentina isn’t as open for business as its leaders would like. When President Mauricio Macri hosted the World Economic Forum in Buenos Aires last year, bus and subway workers went on strike for a day. Protesters gatheredin December when the World Trade Organization hosted its annual summit there. The world spotlight will be on Macri again this year: Argentina hosts the G20 Summit in November. President Trump and other world leaders will probably attend. If this week is any indication, there could be a stir during the G20. Public and private banks collectively offered employees a 9% pay raise that would be adjusted with inflation. But inflation for all of 2017 rose 25%, and it hasn’t eased much so far this year. So employees and their union vehemently rejected the banks’ offer. Bank employees also went on a one-day strike earlier this month. It was just before a holiday and a weekend, which translated to five closed days in total. Other workers in Argentina are unhappy, too. Teachers in the province of Buenos Aires are demanding a 20% pay raise and also went on strike last year. The day after the bank strike ends, the powerful truckers’ union has a huge march scheduled. Some of the protests are in opposition to Macri’s recent austerity measures. His administration has cut hundreds of government jobs and frozen salaries at the cabinet level in an attempt to reel in Argentina’s large fiscal deficit. Can't afford to fly around the world? Wrong! Can the world's oldest bank survive Italy's upheaval? ZTE gets a lifeline in US deal. What happens now? Copyright © 2019 FinanceTruths. Theme: ColorNews by ThemeGrill. Powered by WordPress.